Suffering from any ailments? If so, try eating more tropical fruits. At the Agriculture Heritage Park (Taman Warisan Pertanian) in Putrajaya, Malaysia there is an extensive orchard with a wide variety of tropical fruit trees together with information regarding their supposed health benefits and other uses. According to this, mangosteen is the best tasting fruit in the world. I usually end up throwing about half of them away as they bruise and spoil easily. As for star fruit, the look is better than the taste in my opinion but they seem to have a lot of medicinal benefits. Ciku or Sapodila has multiple uses. The fruit is rich in vitamins and anti-oxidants, the seeds when crushed have a diuretic effect and can expel bladder and kidney stones while the bark contains chicle, the main ingredient for chewing gum. Cempedak is a native Malaysian fruit from the same family as the jackfruit, the main difference being that cempedak grows in bunches whereas jackfruits grow individually. 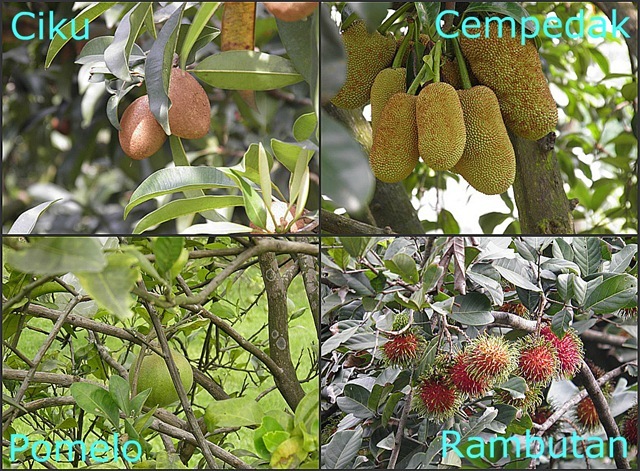 The fruit has medicinal qualities and the tree’s strong timber is used in house and boat-building. Jackfruit timber is used for making furniture and musical instruments. Pomelos are the largest member of the citrus family and are useful for losing weight as they satisfy hunger and speed up the breakdown of protein and fat. When they are in season you should eat them as often as you can to remain in perfect health. Rambutan is derived from the Malay word ‘rambut’ meaning hair. I find them very satisfying to peel. Monkeys like them too. Dragon Fruit have scaly red skin and pink or white flesh with black dots. They are great to look at on the breakfast buffet but the taste usually disappoints (rather bland). But they are high in vitamin C, they can reduce the risk of cancer and treat high blood pressure. Durian is the most famous of Malaysian fruits due to its powerful aroma, distinctive taste and custardy texture. The famous 19th century naturalist, Alfred Russel Wallace said ‘to eat durian is a new sensation worth a voyage to the East to experience’. I agree with him. I love them but they are not everybody’s cup of tea. As you can see from the photo they grow big and they sprout from the tree already wrapped in plastic bags because they smell so bad! Longan, also known as mata kucing or cat eye, contains anti-oxidants and apparently can cure snake bites. Not very useful information unless you happen to be carrying a bunch of longan when you get bitten. Other fruits featured in the park include guava, which has 3 times more vitamin C than an orange, vitamin A and B, can help treat type-2 diabetes, inhibit the growth of cancer cells and is good for anti-aging skin care. 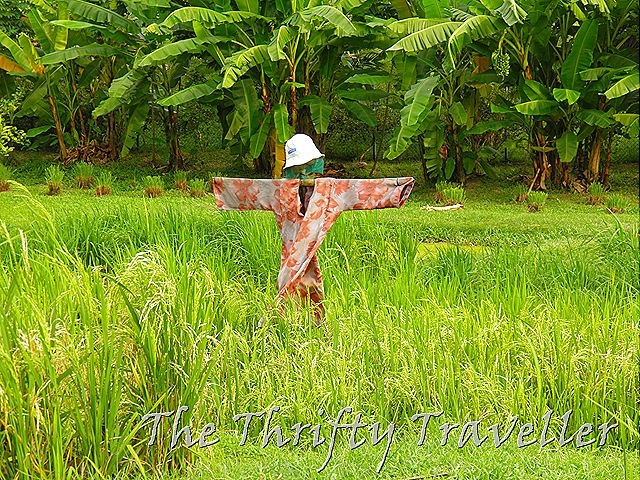 Apart from fruit trees, the Agriculture Heritage Park has herbs and spices, rubber trees, oil palms and even a mini rice paddy field. Lemon Grass (serai) is of course famous for dishes like tom yam soup and rendang. No only does it add a delicious flavour, it can treat headaches, rheumatism, sore joints and urinary problems. Pandanus or screwpine (pandan wangi) is a common food flavouring and colouring in Malaysian cuisine. It can help to relieve wind and aids digestion problems. Citronella (serai wangi) is well known as an insect repellent (especially mosquitoes) but it is also a snake repellent. So rub some of this on your body and you won’t need to carry a bunch of longans with you! Citronella oil can also relieve abdominal pains. Java Tea or cat’s whiskers (misai kuching) is a non-descript sort of herb (looks a bit like mint) but it seems to have miraculous qualities. It is claimed to clean blood, treat kidney stones, lumbago, kidney inflammation, fever, diabetes, high blood pressure and urinary problems. Another miracle plant apparently is Ylang-Ylang (kenanga) , a vine said to be an antibiotic and antiseptic, good for pimples and matte-face, acts an anti-aging agent, can reduce malarial fever, cure asthma and breathing problems. It smells nice too. So remember, a durian a day keeps the doctor away. It also keeps everyone else away.